My overall stay was pleasing. The staff were very friendly and helpful. It is close to shopping and many restaurants and bars. I would definitely stay again. Horrible customer service. We had an issue with our reservation and the hotel was not willing to work with us or refund any monies back. Great location. Hotel is a bit dated. Room was a bit musty, but hotel staff is amazingly friendly and helpful. Need some updating and repairs. The room smelled musty. The hotel was quiet and in a great location for our event. We could walk to everything we wanted to see yet we didn’t have to deal with the bourbon street noise late into the night. It was a family trip. Only drawback was no free WiFi, had to pay, and no free breakfast. We did order room service one night and it was very good and reasonably priced. Hotel is nice but we only stayed there because of the 99.00 special. Beds are nice but rooms are very noisy. Walls must be made out of cardboard because we could hear everything the rooms next to us were saying. Definitely would not recommend-not up to par with other Marriotts ! We went for a spring break vacation- and loved everything about the location. It was near some very good restaurants, and the walk along the river through the outlet mall was easy. The staff was very helpful. They upgraded us to a king-sized room the second night of our stay, as soon as they had one available. Thank you! When I arrived at this hotel it was very late—was delayed 5 hours and was traveling for a total 30+ because of weather. It was raining buckets when I was dropped off in the dark, in this unfamiliar city. I asked the Airport Shuttle driver where my hotel was, and he pointed across multiple lanes of traffic and said, “it’s right there.” I didn’t realize at the time that this wasn’t the usual procedure and looked for a crosswalk. It was a block down. I walked there dragging a large suitcase and 2 carry ons. I crossed the street with the walk signal and almost got all the way across when a large vehicle zoomed by and soaked me even more with a fan of muddy water. I walked back up the block to the hotel and arrived exhausted, hungry and mad as a wet hen. The supervisor in charge saw right away my condition and turned my experience around immediately. She was genuinely kind and helped me report the incident to the airport shuttle. She saw me in, checked on me later, gave me a hug before I checked out four days later. Her name is Susana Martinez and she would be welcome in my home as she made me welcome at the Marriott. She is the epitome of hospitality and Marriott is very lucky to have her in their administration. Enjoyed my experience. Staff was very helpful. Felt very comfortable. The hotel was good and the staff was friendly. The only thing which requires improvement in my opinion is the housekeeping which was not perfect and a bit slow, but I was there for Mardi Gras so it's understandable. Also, note the swimming pool is tiny and not suitable for actual swimming. I was fortunate to stay at the Marriott Convention Center while attending a conference. The convenience saved time, and money on cabs and the staff were exceptional in their assistance and hospitality. The hotel is clean, comfortable and convenient and I recommend it to both business and leisure travelers as the proximity to the Warehouse district is wonderful -- thank you! Conveniently located to everything. Walking distance to Casino and Mall with trolley to the French Quarter. I had a two night-stay and it was very good. The most attractive feature of staying at this place is it close proximity to the New Orleans Convention Center and the RiverWalk. Hotel was nice and clean, up to date. Was within walking distance to Fulton Place Parking Garage, New Orleans riverwalk mall, Harrahs Casino, and the carnival cruise ship terminal. Would definitely stay again. Everything was awesome, from the front desk clerk as we arrived late at night, to the Bell Staff as we needed there assistance, highly recommend this Hotel - especially if you are taking a cruise out of New Orleans terminal. Clean room. Quiet. Comfortable. All around great room. Located in Lower Garden District, New Orleans Downtown Marriott at the Convention Center is adjacent to Julia Street Cruise Terminal and within a 10-minute walk of other popular attractions like Ernest N. Morial Convention Center. This 331-room, 3.5-star hotel has a restaurant, an outdoor pool, and a 24-hour fitness center. In addition to a restaurant that serves breakfast, lunch, and dinner, there's also a bar. Savor a meal from the privacy of your room with 24-hour room service, or get a pick-me-up at the coffee shop/café. Buffet breakfast is offered for a fee each morning from 6:30 AM to 11 AM. A 42-inch flat-screen TV comes with cable channels and pay movies, and guests can stay connected with WiFi and wired Internet. Beds sport premium bedding and the bathroom offers a hair dryer and free toiletries. Other standard amenities include a coffee maker, a safe, and a phone. 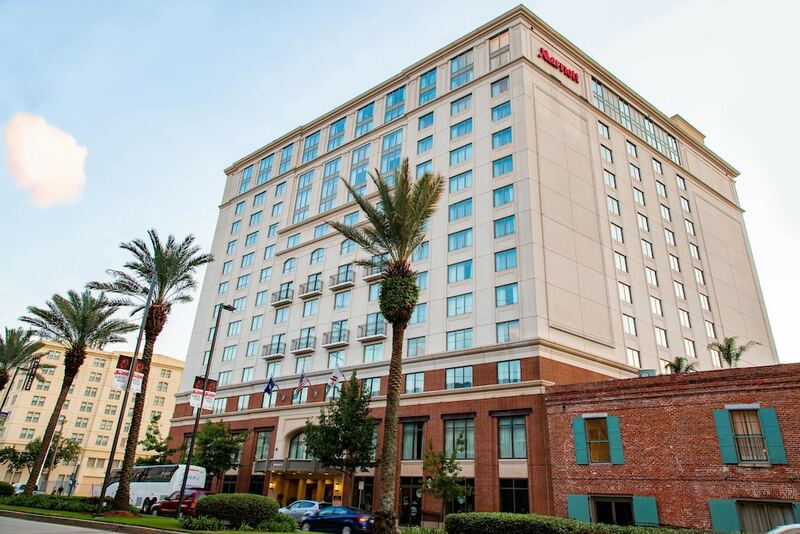 Guests staying at New Orleans Downtown Marriott at the Convention Center enjoy an outdoor pool, a 24-hour fitness center, and free WiFi in public areas. Valet parking is available for USD 39 per day. The 24-hour front desk has multilingual staff ready to assist with dry cleaning/laundry, securing valuables, and concierge services. Additional amenities include conference space, a business center, and express check-in. Wolfes - Restaurant open daily for breakfast, lunch, and dinner. Wolfe's Bar - Bar open daily for lunch and dinner. Starbucks - Coffee shop open daily for breakfast and lunch. Recreation features at New Orleans Downtown Marriott at the Convention Center include an outdoor pool and a 24-hour fitness center. The preferred airport is New Orleans, LA (MSY-Louis Armstrong New Orleans Intl. ): 22-min drive, 15.9 mi/25.5 km.